Today the GBATemp user Ac_K released the first public alpha version of AmiiBomb — the Windows application which makes amiibo cloning fast and easy. And when the hardware is ready? You have to run AmiiBomb, Set an Amiibo folder (*.bin files), select the Amiibo Keys, flash the AmiiBombuino Firmware to the Arduino, and you are ready to Read and Write Amiibo Tag. It’s the folder where you can put your Amiibo dump (found on internet, Google is your friend for that). You can save the readed Amiibo here too, to write it back to another NTAG. You don’t have to re-execute AmiiBomb, it’s looking for folder changes automatically. You probably already have them if you know a little how Amiibo cloning works. If not, a little helper is in AmiiBomb. For Copyright, we can’t distribute them, but there is many place to found them. AmiiBomb send you to the right website, you juste have to highlight the keys chars and copy them to the Clipboard, AmiiBomb check if a valid keys was inside, and ask you to them. If you have already them, you just have to select the keys file. Just an Arduino program who communicate with AmiiBomb, You can flash it through the Arduino IDE or using the Flasher Program in AmiiBomb. – Grab info of an Amiibo Dump via Amiibo.life website. – Cache system for Amiibo Dump informations in a file. – Enable/Disable and Reset Informations Caching files. – Reconize encrypted/decrypted Amiibo Dump. – Extract and Write AppData of an Amiibo Dump (partially done). – Help to found Amiibo Keys and Autodetect them in Clipboard for save them in file (a bug need to be fixed). – Multilanguages (Right now english and french, contact me if you want to translate it). – Read a NTAG215 and save it to an Amiibo Dump file. – Write an Amiibo Dump file to an NTAG215. – Flash AmiiBombuino Firmware inside AmiiBomb. – Get Amiibo Tag Basic Informations. – AppData Swap before create Tag. – Many little things to do AmiiBomb more User Friendly. – It’s work really fine with an NTAG215 but I don’t know if it’s work with an Amiibo ^^’! 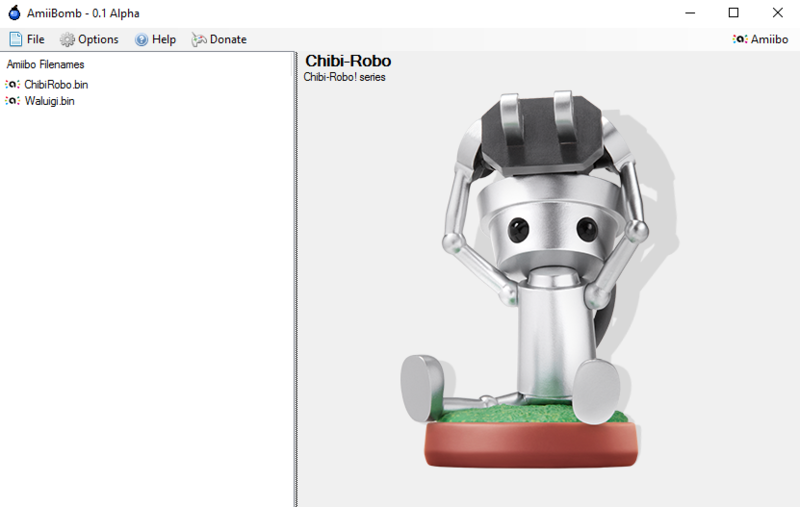 – AppData editor (for SSB Amiibo or any others who have interesting things inside). – Support PN532 NFC Module in AmiiBombuino. – Do it Open Source. In a future, I would own an N2 and a PowerSaves to add many functionality as possible in AmiiBomb. If you have any kind of ideas or suggestions, just let me know! I haven’t had a chance to try it yet, but this tool looks promising! You can get more info and join the conversation in the original blog post. Ac_K has updated the tool to version 0.2 Alpha, making it more stable and open source! Fix an UI bug when main windows was minimize (Thanks dtomcat). Fix bugs inside Password and Long UID calculations (Thanks dtomcat and StandardBus). Temp Fix SerialPortStream bug with certains Arduino (Thanks Gizmo). Translation files are now added dynamically. Check necessary files presence on startup. XLoader now added directly in the menu. Add check if AmiiBombuino is installed or not when COM Port is selected. Add Timeout of 3000ms in Serial Response. German translation added (Thanks aut0mat3d). Swedish translation added (Thanks Gizmo). Italian translation added (Thanks StandardBus). Add a forget message when delete cache files is done. Change way to detect if *.bin file is encrypted. Add Donators to the About windows. Add Spoof UID of *.bin file (For N2/PowerTag). Add Twilight Princess Wolf AppData Editor. Hi @ac_kac_k:disqus, thanks for your nice tool! Also It is so nice of you to put my name into the credits section. Thanks!